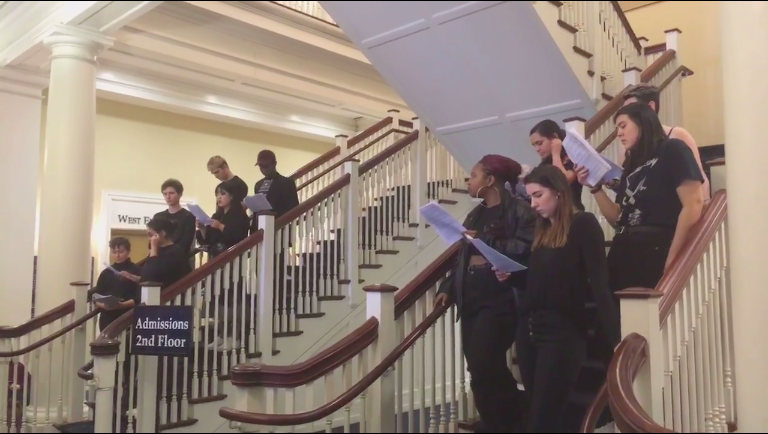 On Monday, April 1, core members of the group Organizing for Survivors stood on Parrish Steps to announce their second set of demands, including both new criticisms and a re-emphasis of previously some unaddressed demands which were first presented last spring. Since the re-release of the demands, the group has focused its organization efforts around Public Safety, including disrupting the Public Safety Advisory Committee meeting on April 4. According to Olivia Smith ’21, a core member of O4S, the new demands were created collaboratively at meetings open to the campus community. The suggestions from these exercises were then narrowed down into concrete requests and demands. The re-released O4S demands include many of the previous demands that they feel were either not addressed or not met. The demands continued the group’s focus on restructuring the college Title IX policy; however, they also added newer focuses of specializing CAPS for survivors of sexual assault, reimagining the purpose of campus safety, and addressing the conscious remission of sexual harm in the academic culture. Gene Witkowski ’21 felt that the group’s demands reignited a conversation around Title IX issues. “It’s so easy to feel like people are just sliding things under the rug and people don’t like to talk about things, especially when it comes to sexual assault. I think [the re-release] was a space where we were challenging that,” he said. Because more students attended the re-release than attended the original release, Kathy Nguyen ’21 was pleased with the student response to the event. Smith was encouraged both by the turnout and the new demands themselves, especially those regarding academics, CAPS, and Public Safety. “We’d had CAPS and Pub Safe in our last release but not in this form; it’s way more thought out,” she said. Amal Haddad ’22, also a member of O4S core, agreed that the new areas of concern were important in adding to O4S’s cause. “I think our demands around Pub Safe and CAPS are really important because, although we won a lot in the Title IX process last year, nothing really changed with CAPS and Pub Safe and I’m glad we’re refocusing on that this year,” she said. As part of this new focus, last Thursday, several members of O4S entered a closed meeting of the Public Safety Advisory Committee meeting, which included Director of Public Safety Mike Hill. According to Haddad, the O4S members went into the meeting and introduced themselves, read the relevant demands, and allowed for questions. Specifically, these demands stated that Pub Safe cease hiring ex-police officers, prison guards, and military contractors, train the staff in trauma response, cultural competency, and anti-oppression, and provide students with accessible ways to report misconduct outside of the Pub Safe sphere of influence. O4S posted a video of the part of the meeting during which Hill responded to their disruption on their Facebook page. Haddad felt that administrators present did not have the correct response. Hill, in an email to the Phoenix, re-emphasized his commitment to conversation. Rose Ridder ’20, a member of the advisory committee, supports O4S’ efforts for community accountability. “I think what O4S is doing is absolutely vital, and these issues need to be heard. I am glad that O4S is attempting to keep the Swarthmore administrators accountable and thinking about the supports, resources, and policies that affect students – particularly in a student’s most vulnerable time,” she said. However, Ridder felt that the action itself did not contribute to improving the relations between Pub Safe and O4S. Smith believes that tense nature of the action did not detract from its efficacy. One of O4S’ central criticisms was with regard to the external review of Public Safety. Last year, the organization called for an external review to address issues of Public Safety’s bias on the basis of identity. After the demand, the firm D. Stafford & Associates conducted a review and issued a series of recommendations. These included expanding community relations, increasing student involvement, creating new guidelines for handling of IX cases, and increasing the department’s visibility and accessibility, but did not explicitly address the question of bias. According to Hill, the external review has led to change within the organization. Despite the lack of explicit acknowledgement in the external review recommendations, Hill believes that the Department of Public Safety prioritizes issues of bias. “As an African American cisgender male, I appreciate the importance of ensuring that every effort be made by each member of my team to respond fairly and consistently in all of their interactions with community members. When allegations of bias or misconduct are raised, they are investigated promptly and in collaboration with Human Resources to the fullest extent possible so that appropriate educational or corrective steps can be taken. I hope students will understand that all of us want to be able to investigate allegations promptly and that we need as much information as possible to do so,” said Hill. However, Gene Witkowski ’21, an attendee of the O4S envisioning meetings and re-release, agrees with O4S that Pub Safe is not as impartial as it should be. This question of safety is not only comprised of the renewal of demands regarding Pub Safe, but also is a re-emphasis of improving Title IX. Smith is particularly excited about her work with Jayne. “I think the [demands] I’m personally most excited about is continuing to work with the Title IX office and Bindu on implementing a behavioral change option; I think that’s integral to any sort of robust work in Title IX as well as expanding the office in general to two or three Title IX coordinators that address the ways that survivorship is not just straight white women getting assaulted in fraternities,” she said. However, Smith, who is also a member of the Task Force on Student Social Events and Community Standards, is hoping that O4S’ fraternity related demands, which include a termination of the leases of the fraternity houses, lead to effective reformation in those areas. “As someone who is involved in organizing around the fraternities … I’m really hopeful that we get more traction in that work this year and that we focus on what social life could be in its best form,” she said. Haddad also believes that the demands regarding the frats and the work of the task force coincide to offer the maximum opportunity for institutional change. “I also think that because with the task force, the demands on the frat are really timely and significant because of the way the institutional time works,” she said. According to Professor Lisa Meeden, co-chair of the Task Force, the task force has discussed the access that Greek life has to alcohol funds and how that affects their social influence on campus. “One of the things we’ve heard is that [Greek life] does play a large role on campus because they have access to funds to buy alcohol, it makes it a little bit easier for them to throw parties than the average student group. And so that definitely became something that we thought a lot about and talked about, because who has the money to buy alcohol has more … influence on the kind of social life that’s going on on campus,” Meeden said. While the task force has explored the role of fraternities — one of O4S’ demands — there is not a specific role that O4S has in the responsibilities of the task force. Meeden said that O4S was one group out of many that were consulted. “I don’t feel like O4S has a specific role related to the task force other than they were a group that we consulted with and we listened to them but they were just one of many,” Meeden said. Last year, the Ad Hoc Committee on Wellbeing, Belonging, and Social Life recommended that a moratorium be placed on the leases for the on-campus fraternity houses while the task force considered Greek life on campus. President Smith chose not to follow this recommendation. According to Haddad, this has led to some skepticism surrounding the task force; any recommendations they might make would require President Smith to take action if they want to constitute change. The re-release of O4S’ demands, according to Emma Miller ’22, was a positive indication that the college could work towards institutional change. “Personally I felt a lot of hope listening to the demands because they were creative, well thought out solutions to what is obviously a very complex problem and its inspiring me to see what can be accomplished when people come together to fight for something they’re really passionate about … The only question now is how the college responds,” said Miller.